Bed And Breakfast400 sq. 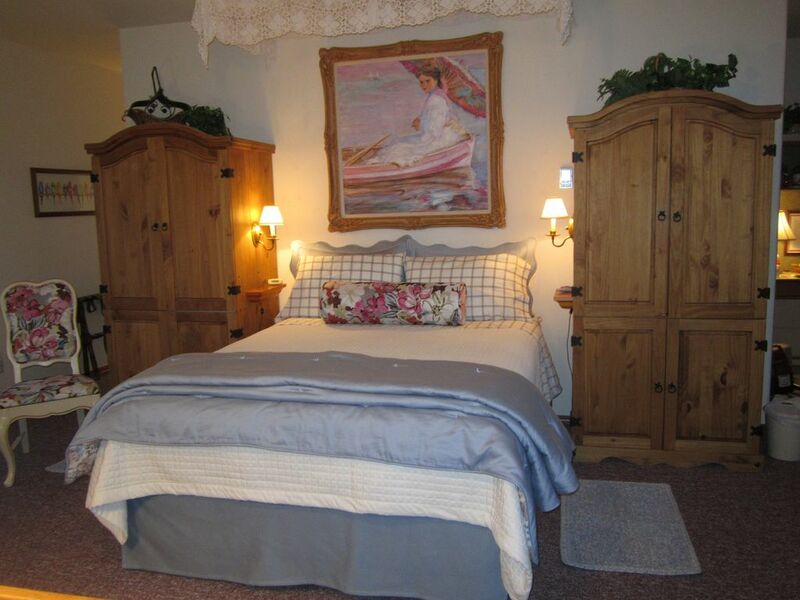 ft.
1 guest suite (bed/sitting room; can sleep 3), 1 bathroom, on river. 1) We are unable to take reservations of more than 6 days. 2) We offer breakfast as an option, so be sure to read "About breakfast," below. 3) For groups of up to 5 visitors, we can accommodate a maximum of 2 guests in a private room with en-suite bath (Listing #1122532) in the host's home (the bed/sitting room is separate from the house). Lark Landing is situated in southern Colorado on 5 1/2 beautifully landscaped acres with the Arkansas River running right outside your door. We are quiet and secluded, yet just two miles from the restaurants and antique shops of Florence, 12 miles from the attractions of Canon City and a half-hour scenic drive from both Colorado Springs and colorful Pueblo. The 400-sq.-ft. "carriage house" guest suite features a private deck overlooking the river, a cozy sitting area, pretty dining table in front of large windows, a fully-equipped "kitchenette" (cleverly tucked into an armoire), private attached bath, and all the amenities to make this your home away from home. You can fish from our "pier," walk through the adjacent wildlife refuge, feed our goats, pick fresh veggies in our garden, and enjoy s'mores around the fire pit. Lark Landing isn't about a place to crash for the night -- it's about relaxation and fun in unique natural surroundings with the whisper of the river to lull you to sleep. About breakfast: As an economic option for our guests, our published rates do not include breakfast (you are welcome to provide your own meals). If you would like breakfast included as an up-charge to your room rate just let us know. We have an extensive menu, and you have the choice of enjoying it delivered piping hot to your suite, or enjoying it with us in our dining room. Breakfast option is $7 per person per day, payable with cash or check when you arrive. Husband Mark and I (Barbara) purchased this riverside property specifically to open a guest retreat. We moved here from Denver and have never looked back. The place was a shoebox on a pile of rocks when we bought it, but over the years, we have created a beautifully landscaped, beautifully decorated resort-like retreat. Our vision is to offer guests an experience very different from their usual daily routines. You probably will be our only guests, and the guest suite is private and separate from the house. The suite's secluded deck and large windows overlook nearly 360-degree views of mountains, woods and the river. Bathroom includes toilet; shower (no tub); single vanity w/sink; upholstered bench; storage cabinet w/extra towels, soap, TP, etc. Terrace on the river. Fishing from the property. Sitting area with sofa, chairs, coffee table, lamps. Coffee, tea, sugar and sweetener, S&P. Guests provide all their own food and condiments. Service for 4, plus extra cups & glasses. Food prep items in your suite include microwave, fridge, toaster & coffee maker; dishes, silverware & mixing bowls. Best for heating prepared breakfast foods & frozen entrees. Host's kitchen NOT OPEN. Table in suite seats 2 comfortably, can accommodate 3. Lots of books on many subjects: History, flora & fauna; biography; novels. Puzzles, cards, board games are in suite. Beautifully landscaped grounds situated on Arkansas River. Property includes terrace on river; additional 1/2 acre pond (see Boats, below); flower & vegetable gardens, picnic table overlooking river. Guests may ride but need to sign a waiver releasing us from any liability. We offer a small inflatable boat for paddling around our pond, but guests must sign a waiver releasing us from any liability. Note: We cannot permit nor be associated with any boating on river. Private deck overlooking river. Great breakfast spot. Guests may use their own inner tubes for river tubing, and float from Florence to the city park adjacent to us where they can get out and walk back here, BUT WE CANNOT BE INVOLVED IN ANY WAY. There are 2 local 18-hole golf courses within minutes from us. One is a Gary Player "signature" course. Suite is on second story and is accessed via a flight of stairs. Not suitable for people with mobility issues. This the perfect place for celebrating a birthday, wedding night or anniversary. Make it extra-memorable with our pretty special occasion set-up (see it in the Photos section) which includes your choice of champagne or sparkling cider, a customized cake, flowers, greeting card, and inscribed framed photo of the two of you -- all for only $45. We offer a unique venue for private celebrations, so come and enjoy our accessible riverfront setting, which is landscaped and developed for fishing or just sitting. Have fun in a small farm setting with 2 cuddly cats, goats & chickens, waterfowl, and a vegetable garden where you can pick and purchase fresh produce. Lark Landing's carriage house and its surroundings are truly a slice of heaven. The owners, Barbara and Mark, are simply the most kind and generous hosts to be found. They both work together meticulously to create the ultimate atmosphere and experience, not like a stay at a motel/hotel. The made-to-order breakfasts are scrumptious, while the spacious and clean living quarters offer everything you need - and want - for an upscale, yet affordable, comfortable and home-like getaway. The property is much better described as a resort, as the sprawling lawn, gardens, pond and fountain, animals (goats, chickens, ducks, etc. ), and location on the Arkansas River create a sort of Utopia. Beyond walking the grounds, it is pleasant to take a moment to sit on but a few of the chairs and benches placed 'just so' to grasp beautiful glimpses of nature in all its splendor. There are garden pots full of flowers everywhere! Fishing from your own personal pier - couldn't ask for more. Highly recommend this property - just can't say enough! I'll definitely be back!! We loved our stay at Lark Landing! The location was great for us and worked well for the things we wanted to do and see. Barbara and Mark were excellent hosts and we enjoyed our conversations with them. The balcony was a great place to sit and enjoy the scenery and the sounds of the river! I would love to return someday. My husband and I would highly reccomend this very private, picturesque, romantic and cozy Rverside Retreat. We loved leaving our sliding deck door open at night, so that we could listen to the sounds of the Arkansas River flowing by! Barbara and Mark were very hospitable and made us feel like we were friends or family who had come for a visit, yet we at the same time felt we were the only people on the property, amongst the birds, sheep and cows!! This retreat was in a great location to take in site seeing and spending time with family in Colorado Springs and West Pueblo. We also enjoyed time spent in Canyon City and Florence! Barbara Jameson, one of the owners, is a renaissance person! She is a very creative person who backs it up with hard work everyday. Barbara is married to Mark and they take care of the property. They have created the Retreat and their wish is for you to enjoy your stay! My wife and I enjoyed ours and we believe that you will enjoy yours. Best Place we stayed on a week-long trip. After spending a whole lot more on a place in Colorado Springs, we were so happy to get to Florence & stay on the Arkansas River. It was our most relaxing place that we stayed. We spent two nights here. We wished we had just come here in the first place & stayed a week! Maybe next time. Barbara & her hubby were super nice and they were down-to-earth & friendly. It was fun joking with Barbara. Her cottage was spotless. It is the cleanest place that we have ever stayed in. It felt like home. Although it was really nice, it wasn't set up to be super-fancy to where you couldn't relax. We didn't have time to go fishing but hope to do that next time. We met some other guests who were staying in the B & B portion of their place. They said they were really having a good time as well. The little goats were cute, the garden was amazing, and the whole place was done up with beautiful and detailed landscapes of different types of flowers and pretty rocks and things. This couple must work all the time on upkeep and it shows. It rained for part of our visit and it was just great watching it rain on the river and see the river pick up some. It was fun to read some of the things that other guests wrote in the visitor's journal. Also interesting was Barbara's story that she wrote concerning how and why she picked out each piece of furnitue for the lodge. I hope she keeps writing! Again - a very special inviting & safe place. We especially appreciate Lynn's kind comments because she also is an innkeeper: She runs a not-for-profit lodge in Dexter, Kansas, so she knows what it takes to provide excellent service and care. Her lodge helps to support a volunteer-run library devoted to promoting literacy and computer skills in rural Kansas, so check it out and give her a call when you are in her neck of the woods: Lighthouse Library. Barbara and Mark were the perfect hosts. The guest house was impeccably clean and neat as a pin. Barbara thought of everything down to the last detail. The Arkansas river lulled us to sleep, the deck and room felt very private. We will be back and will tell our friends and family. This is the sort of couple that is a host's dream: Friendly, of good cheer, tidy and appreciative of all the little details that hosts provide for the comfort and convenience of their guests. We hope to see these nice people again! For 2 guests who require 2 beds there is a one-time "extra bed" fee of $30 to cover additional labor & laundry expenses. (You only pay the fee once, regardless of how many nights you stay.) Breakfast: To keep our rates competitive, guests have the option of providing their own breakfast, so breakfast IS NOT INCLUDED in the price of the room; however, it can be arranged for separately when you arrive. Our breakfasts are a flat rate of $7 per person per day (in other words, $14 for breakfast for a couple), payable by check or in cash after you arrive. We offer an extensive, gourmet menu, raise our own eggs, bake our own bread and, seasonally, incorporate our own garden produce into our menu. PLUS: You get to choose your breakfast time of between 8- and 10 a.m, and you probably will be our only guests so you don't need to be nice to a bunch of strangers at the crack of dawn. Enjoy room service in your suite (cheerfully delivered piping hot in a big basket), or with us in our dining room or, on balmy mornings, on our deck. This, really, is the way to go!